Neil. wrote: God, I still feel for Cait, y'know. Must be a bit of a stinger for her, Elvis having babies with Diana when he never gave her any. Hope she's found a fella and settled down - someone who can give her a family and lotsa love. Still, I guess the trickle of royalties from the EC 'Best of' album might be some recompense - though I notice the Warhol style one doesn't seem to be on the shelves any more, so none of her songs would be on the older best of. Gah! I do believe there was a "lost" pregnancy early on in their relationship. I remember a Rolling Stone article from back in 1987/88??? that said she was "showing" a bump and was pregnant. You never heard another thing about it but word was she lost a son pretty far along too. Other's say it was a "still-born" birth. She was told she could have no more children. That was a painful experience for both of them. God blessed EC with these twins- it is almost like he got back the babies he lost with both Cait and Bebe. For those who speak French, "Le sens common n'est pas si commun." According to a report in The (Dublin) Evening Herald today all the participants have been practising rigorously for the last 3 weeks and their trainers are very impressed. The programme has good PR people behind it so all kinds of tabloid nonsense will be conjured up to provide copy to fill Irish newspapers next week in the run up to the big day. So maybe CÃ¡it will pull a contrived wobbly about something, we'll see. martinfoyle wrote: So maybe CÃ¡it will pull a contrived wobbly about something, we'll see. Ooh you cynic you! How could you even think such a thing? That's a ref to the RTE link, right? No, they got that wrong. I can't see or hear the name of C O'R without hearing Shane rasp 'y la suntuosa Cait O'Riordan'. Cait looked great and seemed to really enjoy the show. On first , wearing what she described as a '70's' costume ( black dress with white motifs , matched with a similar hairband), she and her male coach danced to Joe Dolans's You're Such A Good Looking Woman. The judges made kind remarks about her 'enthusiasm ' etc. Marty Whelan's intro. comments described her as the 'ultimate rock chick' , mentioning her work with the Pogues and Gavin Friday. Marty also asked her about news that she was studying and she told of how she is doing a psychology course with the UCD Adult Education Centre. She also talked about how her nieces were in the audience and how they think she is the coolest aunt ever etc. A short report on her training showed her throwing shapes etc. in a AC/DC t-shirt and jeans. She didn't win through to the second round and was good humoured in her departure comments. She said that even her nieces had preferred another contestant so she knew then she wouldn't win. I saw the show on tape and fast forwarded to any bits that seemed to feature Cait. She seemed to pop up in various other group things , smiling all the time. The above link promises to have extracts for , eventually, viewing. Former Pogue CÃ¡it O'Riordan tells Gemma Tipton about her angry years and her new venture with a band of divorcees. 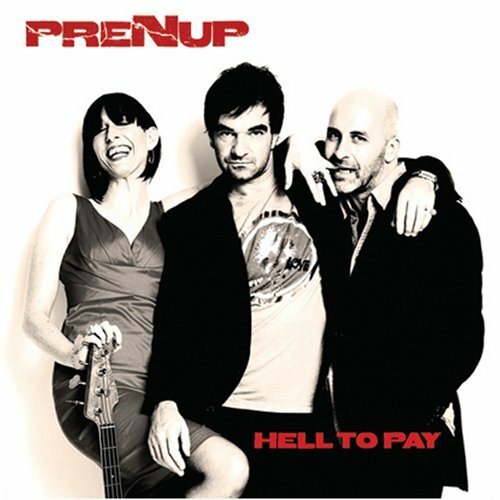 PreNup have been spending time in one of their favorite places, New York City, putting together an exciting team to help launch their debut album 'Hell to Pay' due for release in early Summer 2007. They have just landed their first North American show at Mother Egans on 6th St in Austin, Texas on Sat 17th March as part of the South by Southwest music festival. They will also be popping up around Austin at other venues throughout the festivities. April will see them returning to the US touring with Hothouse Flowers in preparation for the CD release in May. Hi everyone! Greetings from our rockin' rehearsals in Dublin.. we are fine tuning our set and having lots of fun in the process! Just to let you know that we have landed a show at the Swollen Circus @ the Hole in the Wall in Austin TX on the 13th March at 830... this will be an acoustic performance! And also we have agreed to do a second set at Mother Egans on the 17th March at 9pm... so thats two shows at Mother Egans .. one at 630pm and one at 9pm! Rockin n rollin n strummin in Texas! PreNup played their first SXSW gig last Tuesday at the Swollen Circus, a musical extravaganza hosted by Walter Salas Humara and Michael Hall at the Hole in the Wall! Their three song set was very warmly received! "Technicolor" opened their all too short short set, followed by an emotive "Firefighter" finishing up with the crowd singing along to "Foolish Love". Fiachna in white and Dave in black... they look forward to Saturdays shows at Mother Egans! 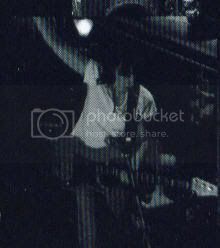 Check photos at http://www.stevehopson.com .. just look for PreNup in ther index! And then there are the solo projects: Ã“ MaonlaÃ­ has recorded a solo album while Ã“ BraonÃ¡in has formed Prenup with Hothouse Flowers drummer Dave Clarke and bassist CÃ¡it O Riordan of legendary Irish group the Pogues. "What catalysed this new band is CÃ¡it heard some songs I was working on, and she encouraged me to do something with them and encouraged me to sing myself. So the next logical step was to ask her to play bass and get Dave to play drums. We decided to see if we could go and write some songs, so the three of us went over to a rehearsal room and spent a few days throwing a bunch of ideas together and we wrote lots of songs and we spent a matter of three or four days recording them all. So it all happened very quickly and very naturally." "It's great to be able to start a new band when you're in your forties!" he laughs, heartily. Aw, that's nice to read the article further up the page about Cait not being bitter, and looking back on her marriage as an amazing time. Glad she's not as bitter as she might've been. This is from the Dublin Evening Herald so it should be taken with a pinch of salt. The Prenup album makes pleasant listening. Cait is credited with bass and vocals . The former is evident in the form of a good solid , uh, base for lots of bluesy guitar stuff and snarly vocals. What vocals she contributes aren't very obvious ; various harmony fills as far as I can hear. CREEPING FROM THE UNDERGROWTH IN THE TWILIGHT OF THE DAY. KEEPS SLIPPING BY LIKE THE SHADOWS IN MY PATH. WHAT WAS IT ABOUT YOU THAT I COULD NOT RESIST? WHAT IS IT ABOUT YOU THAT I MISS? ALL THE MAGAZINES I COULDNâ€™T FINISH BY MY BED. LIKE A BOXING RING BUT THE FIGHTER IS NEVER THERE. SUCKERPUNCHED, NEVER KNOCKED ME DOWN, SUCKERPUNCHED, NEVER KNOCKEO ME DOWN. WHAT WAS IT ABOUT YOU THAT I COULD NOT RESIST? WHAT IS IT ABOUT YOU THAT I MISS? SUCKERPUNCHED NEVER KNOCKED ME DOWN. TIME SEEMS FROZEN BUT NOT IN A TIMELESS WAY. Not exactly 'North' but, hey , what is? A clip from Straight To Hell. I'm just in from evening here in Dublin , starting with a film , ending with a concert - both in the company ( sort of) of Cait O'Riordan. Queuing to get into O'Donoghues Opera in the haphazard line in the packed foyer of the Irish Film Institute , someone behind me is greeted by a man to my left. The someone is Cait and they have a loud conversation about their activities. Standing as she was next to me I had a up-close look and very well she is looking, shiny hair, clear skin etc. Cait moves on into the crowd and manages to skip the line (grrr!) when the door opens. I didn't spot her in the auditorium . Doubtlessly she enjoyed, along with rest of us this, 1960's curio, a 35 minute film featuring folk legends The Dubliners. The story centered around the ballad The Night Before Larry Was Stretched which, of course , Elvis once recorded ; it's on the Rhino edition of Kojak Variety. Three of the group were there, including Ronnie Drew ( wrapped in hat and scarf due to ongoing cancer treatment) , did a short q. and a. with actor Brendan Gleeson afterwards , finishing with a brief song. By then it was 8.30 and I dashed around the corner to The Olympia Theatre , arriving in plenty of time for Squeeze. Difford and Tilbrook served up a superior cabaret version of their back catalogue, to the adulation of a packed venue. In my second row balcony seat I enjoyed it , particularly that amazing way Chris 'n Glenn's voices work so well together. A song or so in I happened to glance around and , yes, guess who was behind me , two rows back , to my left ? Ms Riordan. She and her friends were all smiles and having a ball of a time. Tomorrow I go see Jens Lekman at Whelans - if she's there - well, it'll be all a matter! She's stalking you! She reads your every word here and tries to guess where you might go next. She is sure to be at Whelan's. Were you tempted to say hello to her? Perhaps 'Hello Cait, my name's John and I am a huge specialist in your ex' might not have gone down too well. I have officially dedicated my life to living vicariously through Mr. Foyle. Since she moved in from the suburbs, I frequently see CÃ¡it around town, she being a distinctively tall skinny bird. Since she hasn't had the unique pleasure of seeing the gruesome twosome side by side, she probably thinks there's just the one of us, and goes into ignore-the-stalker-and-he'll-go-away mode whenever we're around. Dublin being a terribly small town in many ways, we have mutual acqaintances and all speak well of her. I doubt she misses the Stepaside years. So after seeing PreNup open for the Flowers 5 times accoustic, in NYC I finally got to see the full band with Cait all electric. IT WAS WORTH THE WAIT! That was amazing guys, Fiachna, you looked like you were going to explode with energy. It sounded amazing. Always enjoyed the accoustic, but THAT is how it is supposed to be! So happy to have been there! Wooo-hooo! Come Down - Cait's bass wasn't working. and through most of the show, her mic didn't seem to be working properly, but fortunately the mic problem seemed to be sorted for this song, and we got to hear her beautiful harmonies.